I’m writing to let you know how incredibly grateful I am to have found your product! I have 5 cats, and while it was the health concerns of 1 that directed me to your site, all my kitties are now eating raw food with your supplement and doing beautifully. My 13 year old female tortoiseshell had been throwing up for 2 years. We ruled out hyperthyroidism, kidney disease, liver disease, pancreatitis, cancer. The assumption became “food sensitivity”. For some time, keeping her off dry food and eating the cleanest canned food possible worked pretty well, but inevitably she would begin throwing up, usually bile. Finally, the vomit became really foul-smelling and she developed diarrhea. That was it! I did my own research beyond the old food sensitivity thing, and discovered that her symptoms matched IBD to the letter. It actually blows my mind that it took 2 years to find the cause of her issues. Rather than going the conventional veterinary route (I wanted to avoid steroids and a lifetime of B12 shots, if possible), I found your site a little over a month ago. Almost from the first meal, our Willa seemed better. The diarrhea stopped pretty much immediately. From the first raw meal, she has only vomited twice. 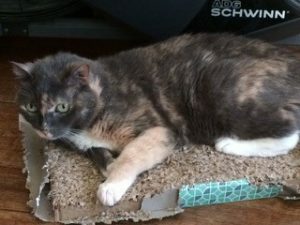 In addition, she has gained some weight – a good thing as she had gotten sort of scrawny – and the gurgling of her digestive system has all but stopped. She has more energy and looks great. What’s more, she absolutely adores her meals, and has done from the very first one. It’s almost as if she knew it was the best thing for her. I work to stagger different protein sources, something that is recommended with IBD – I alternately feed the cats chicken, turkey, duck. Other than sourcing something other than chicken, mixing the food is easy. Thank you so much for such a wonderful resource, both in terms of the products and information.